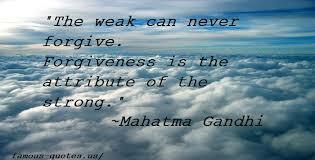 #50: Violence is a tool used by the weak, not the strong! The Curious Incident of the Gap in the Year. The bimonthly travails through life; sometimes avoiding the pointing fingers and arrows of outrageous fortune. The kids are bouncing around as we enter the six-berth Second Class AC sleep for Mumbai from Trivandrum (Thiruvananthapuram!). I wanted to fly up, but the kids want to go on a long train journey, and at eighteen hours, that safely classifies itself as long. They carry on bouncing around, and the look the elderly Indian couple give them as they take their seats opposite us, informs me I better occupy my exuberant offspring. Our male guard/attendant comes to inform us the train will have to be diverted due to flooding down the coast. I wearily ask him how much longer this will add to our journey. He thinks I’m being sarcastic, this is The Indian Railway system, “None Sir, we will reach Mumbai at 4.50am tomorrow morning, precisely.” Can you imagine the replacement bus service? The elderly couple get off after a few hours, replacing them are a newlywed couple in their late twenties: full of love and endorphins – smiley, friendly, especially towards the kids. He is an engineer, and her a nurse. She wants to come and work in England, so I start to tell them how the National Health Service works when they enquire, how it is free at the point of entry, they are shocked by this, as are most people in the world. It is third time I have had this in-depth conversation in India, they all think I’m a pathological liar, so the wife seconds me, and adds some extra bits about taxation, they are still perplexed. “So, you could have an accident and just turn up to a hospital and can have an operation, for free?” The husband asks for both their clarity. “Yes, but you pay for the service through a National Insurance Tax in your wage. “But everyone pays taxes… and you get a free health service!” They really are perplexed. So we go into even greater detail, I pretend to be Aneurin Bevan to confuse them further, and amuse myself – it’s a long journey! The husband gets his own back and tells me of a funeral he has attended up in Assam whilst on an engineering project. At which, two people are pyred, one died five years before and the other, twelve years before! As lots of the family and friends are migrant workers, they do not go ‘home’ very often and these two funerals have been coordinated – two for the price of one, the two people involved might have been less selfish and died together. I am perplexed where you put a dead body for twelve years! He is not in receipt of all the facts. But it is an economy measure well worth considering, everyone knows someone with a half full chest freezer, their cheap to run and funerals are generally expensive occasions! The last one I went to ‘The Godfather’ casket cost two grand! No one would mind if you put another hitchhiker in, would they? Every meal comes with watery Dahl; it is my least favourite Indian Dish, it is the Indian equivalent of mashed potato. Three meals in and I can’t face any more, so I leave it. The rubbish for the carriage collected and we pull into a busy town station, two street-boys wander to the door and I observe the guard exchanging what appears from out of earshot to be harsh words, he then reluctantly hands the bin bag of food remnants over to one of them. They rip it open and rummage through the contents excitedly, separating the food from the empties. More harsh words are exchanged between the guard and what appear to be the two shoeless Dickensian urchins. My son returns a little shocked and I ask him what has happened. “The guard said they could have the rubbish, as long as they promised to put it in the bin!”I tell the story to the four left behind in the air-conditioned compartment, my wife like us two, is shocked, the girl is somewhat oblivious, but the Indian couple seem unmoved by the event, ambivalent. This for me sums the dichotomy of India up, these are two what appear to be caring people, but they give the impression, ‘what can we do about it?’ ‘It is how it is.’ ‘It is their own fault for not getting an education’. At least it has shaken our boy; it will remain with him for a long time, maybe forever – I’m glad I have left my dahl! You will get the same effect by reading ‘A Fine Balance’ by Rohinton Mistry. If you have not read this incredible book, next time you are going to wade through endless seasons of a boxset, don’t, seriously, don’t, read this instead. However depressing you find it; I guarantee it will make you feel so much better about your own life afterwards. The train pulls into Mumbai six minutes early! 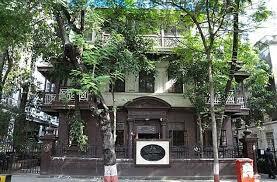 We are staying in the Colaba Causeway Hotel, right next door to Café Leopold. Later in the day we go and watch a Harry Potter film, the enormous cinema only has a splattering of people in. The Indian National Anthem is played and we feel we have to also stand up, or we could end up on the BBC apologising for any offence we have caused the Indian Nation! The ‘local’ adverts are stolen from 1970’s Britain, and both the wife and I joke that there has to be one for an Indian restaurant, the Taj Mahal possibly?, with free poppadums when you show your cinema tickets. It is not called The Taj Mahal, but it is next door!, both the wife and I cheer. This is a cinema in the most modern part of India! The next day we go sightseeing to try and see as much of Mumbai. In the afternoon we end up in Gandhi’s old house, now a museum. It is quite a dry and unimaginative memorial and the kids become bored at the endless display cases that appear to contain a lot of stamps. They start jostling and pushing each other. I have waited since the 1980’s for this very moment, “Violence is a tool used by the weak, not the strong.” I do it in my best Ben Kingsley voice and I’m quite pleased with myself, I smile at it for years to come! I’m smiling now – as the wife sometimes reminds me, I’m a sad man. 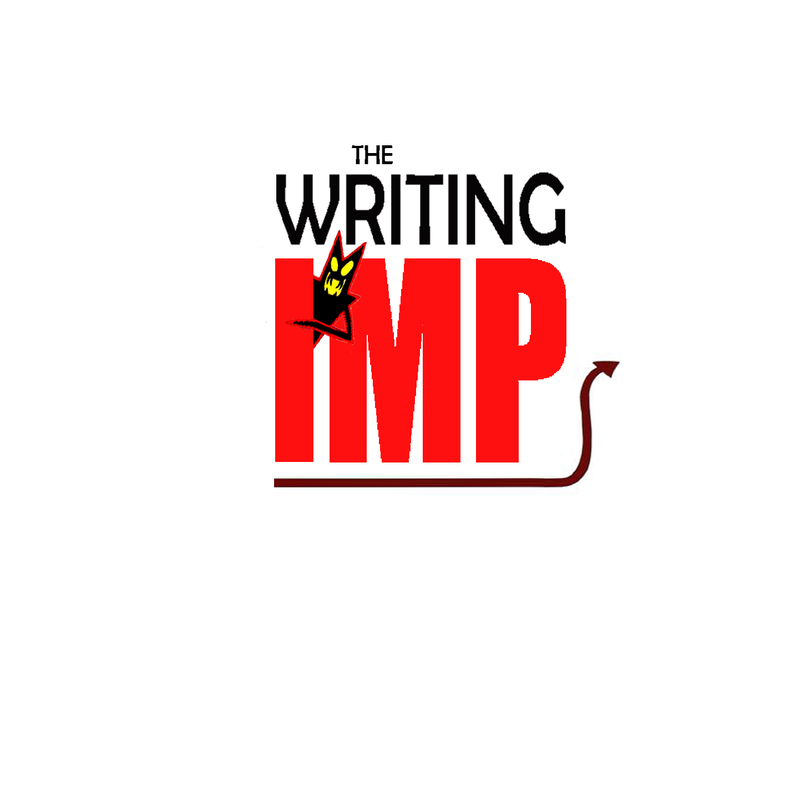 “When I despair with you wife (do the voice, it will make you laugh! ), I remember through history the way of truth and love have always won. There have been tyrants and murderers, and for a time, they seem invincible, but in the end, they always fall. Think of it – always.” “Come on Gandhi, the kids are bored,” and she walks off, even before I can say, “These people seem to want me”, to an empty museum! 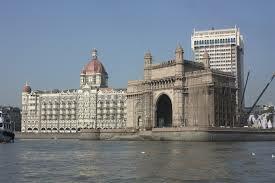 We head to the Taj Hotel by The Gateway to India to buy some books from their excellent shop. They will not let the kids in the bar, so we use this as excuse to plonk the kids in front of the electronic baby-sitter in the hotel bedroom and go and buy a bottle of cold white wine in Leopold’s. It is only the second nice bottle of wine we have had in India in three and a half months. Initially we persevered with the local wine, but it was always awful. We gave in after the first three weeks, but here in Leopold Café and Bar we are in a Humphrey Bogart film surrounded by intellectuals and philosophers, well that’s how it feels. The two places we have visited within minutes of each other will be the setting for the main locations for the 2008 attacks shortly after we visit. We had our wedding reception at the top of The Wold Trade Centre in New York, have visited the same bar in Kuta, Bali, where the biggest bomb exploded and stayed close by to the attack in Sharm el-Sheikh – all before their associated terrorist attacks! Sometimes you are lucky: sometimes your luck runs out! Elephanta Island is 10km off the main hubbub of Mumbai, and a pleasant ferry ride away to visit this UNESCO World heritage site. I have heard one traveller describe the monkeys as ‘bloody vicious’ and the guidebook advocates caution against the thieving primates, there are more than one species – the unknown traveller is correct. 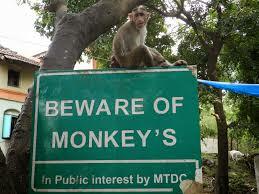 The monkeys are scary, especially the larger Macaque ones. My daughter becomes even more scared as we walk up the narrow gorge strewn with hawkers when a sizable male swops on her packet of biscuits. I have experienced similar ones in Bali, but there we were given sticks and the stallholders had Alsatian dogs! The Hawkers here don’t seem to have such protection, so I reassure myself, but not my family, that we will be fine. My reptilian brain wound tight, I’m now the protective alpha-male, and I’m ready to have an altercation with a relative from further down the evolutionary ladder, just! Some of these are monkeys that were too aggressive to appear at the end of The Wizard of Oz. We eventually arrive at the main cave temple at the top of the hill and the wife tries to gain entry as an Indian National, but they are having none of it. We stick close; we are safer with her then further away with the monkeys. I debate whether to remind the ticket seller that this is the woman from ‘The Coracle Incident’, but I’m not getting involved, and, anyway, I’m on point duty against rogue primates. We decide not to go into the Temple, we’ve had our fill of religious buildings, it’s nothing to do with the sharp words between my partner and the attendant! 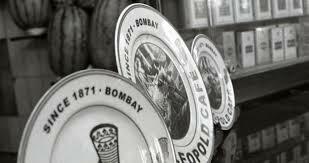 Our reward for being alive and in Mumbai is Leopold’s every night. We are rosy with retrospection about our travels through India, as we practice for stealth drinking back home. We decide against a tour of the slums, we have seen enough poverty, even if this poverty is organised. Lesson over I thank the young coolie on the way out and he says he will find us later to check my pass – very likely, me thinks. Then about fifteen minutes later he’s stood over me in a dark recess in the departure lounge, he must have had to endeavour quite hard to find us, or put some kind of tracking device in my clothing. I am about to enter a ‘Curb Your Enthusiasm’ scenario. I begin to pretend to search for the fictitious pass. The wife interrupts me to remind me. “You haven’t got an Emirate’s lounge pass.” Oh thanks wifey, I say with my accusatory stare. Now realising it was a rhetorical question when she asked about the football experience. “Yeah, the complimentary Emirate’s pass I got given in London.” I try to lie convincingly. “When?”, she furrows her brow as she says it – she not helping, at all. The Lounge coolie explains to the wife what has happened, he informs her if I don’t pay the Rp500 he will go and get his manager. He’s quite assertive for a coolie. I inform him that we only have Rp600 left and my listless slumbering daughter is a diabetic and needs to eat something to raise her blood glucose level.” At least she’s playing along by pretending to be a semi-dead diabetic. She’s not a diabetic, it‘s spiralling into a David Larry situation comedy, but it is the principal of the thing, we are flying with said airline, I haven’t eaten or drunk anything, if you exclude the boy’s gluttony, neither of us have! “ I will have to go and get my manager, if you don’t pay,” Coolie-lounge-jobsworth extolls again. “Oh, just pay him,” Chimes the wife, this from a woman a few days before pretending to be from a different continent of birth to save Rp50 to see a few rudimentary cave drawings! I reluctantly hand the money over, while thinking of millions of annoyed Man U supports to make me feel better! “I hope you’re proud of yourself, my daughter will in discomfort because of you.” He doesn’t care for a fabricated ill eight-year-old diabetic; he has a job to do! I was going to add something prophetic here about our time in India – how we have grown spiritually, morally, closer, more loving as a family, but this is how our time in India ends! Next time: You can eat peanuts with chopsticks?